Explore the beauty and majesty of America’s oldest city on a scenic St. Augustine helicopter tour. 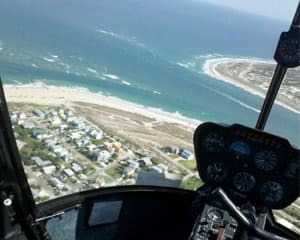 Explore the beauty and majesty of America’s oldest city on a scenic St. Augustine helicopter tour! Board a safe and comfortable helicopter for a thrilling 42-mile flight! Founded in 1565, St. Augustine offers a wealth of sights that are not only beautiful but also at the heart of Florida’s storied history. As you lift off and fly over the Intracoastal waterway, you’ll be treated to a striking view of Castle Otttis, a one of a kind impressionist landscape sculpture modeled off a 1,000 year old Irish castle. Then you’ll swing over to gorgeous North Beach for a thrilling ride along the coast to take in such sights as Porpoise Point, St. Augustine Lighthouse, Anastasia Island, and the St. Augustine Beach Pier. Then it’s down the stunning shoreline of St. Augustine Beach to famous Fort Matanzas guarding the mouth of the Matanzas River before soaring back north for a view of Bridge of Lions, Nombre de Dios Mission, and Castillo de San Marcos, the oldest fort in the continental United States! Whether marveling over the pristine, natural beauty of St. Augustinian beaches or wondering at the magnificence of centuries old national monuments, there’s no better way to experience every sight historic St. Augustine has to offer than on a helicopter flight. Fly with us! Book now!